Aqua Kitty DX presents a classic reviewer's dilemma. On the one hand, its retro, 16-bit micro looks, SID-chip music, bonkers storyline, and basic Defender-inspired gameplay are so simple, how could they possibly stand up to scrutiny against modern shooters like Resogun? But then again, why the hell do I keep playing it? 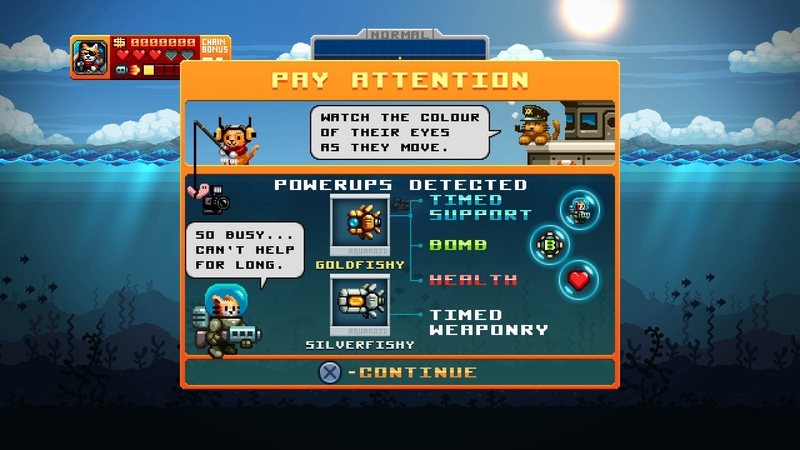 Launched a couple of years ago on PS Vita, Aqua Kitty has been fettled and tweaked, given a new DX suffix, and is now available as a cross-buy purchase for Sony's hand-held, and PS4. After playing the former version for an hour or two because my TV was being used by my significant other, I was delighted to be able to save my game to the cloud when she was done, and continue playing on the big screen with barely having to lift a finger (to press the start button) to carry on from where I left off. 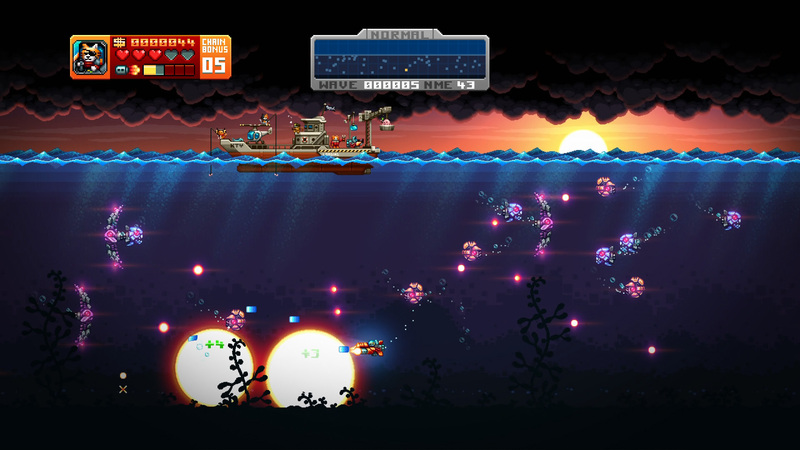 Aqua Kitty DX is no slouch on Vita – indeed its classically inspired, just-one-more-go design makes it a perfect mobile game. 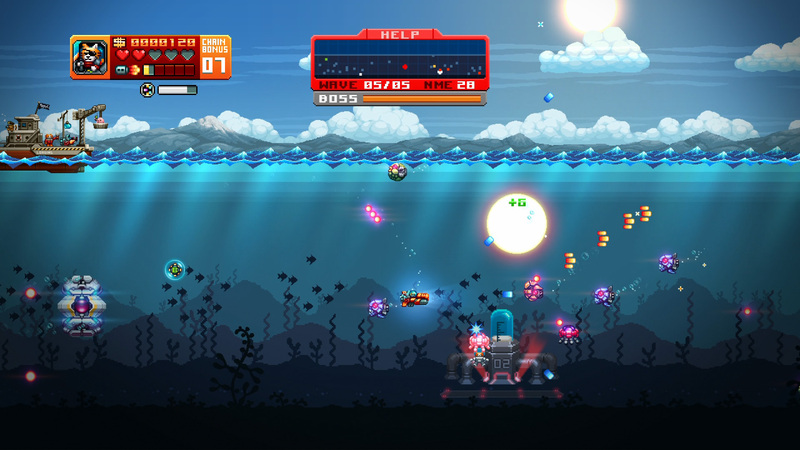 However, when you reach later levels and Aqua Kitty starts descending into the nine levels of bullet hell, playing on PS4 and being able to see everything in full 1080p means you can more easily (relatively speaking) spot microscopic gaps to safely pilot your cat-driven submarine through. 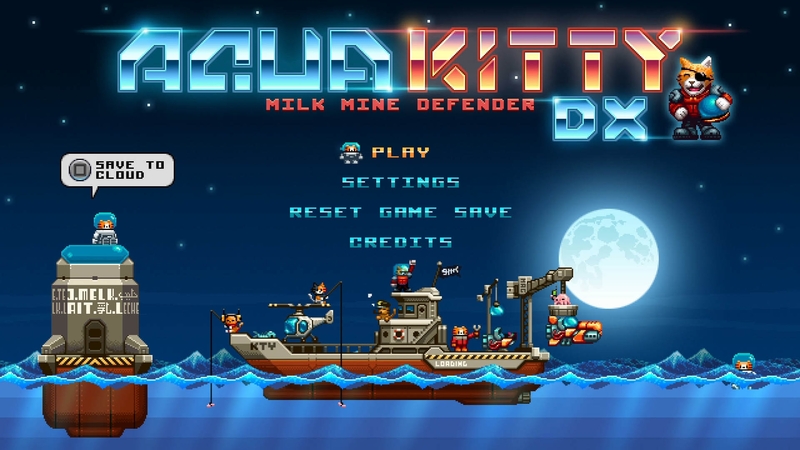 When you get down to the brass tacks, Aqua Kitty DX is an extremely simple game: defend the little sub-mariner kitties who are pumping milk from newly found full-fat reserves deep below the ocean from being whisked away by robots. Yep. This game makes no sense at all, but then that's true of most arcade games from the era upon which this game draws its inspiration. Ultimately, it's all just an excuse to fly around the wrap-around screen and shoot everything in sight – including bigger robots and bosses that regularly show up to make your life even more difficult. Monsters have their own behavior patterns to learn, and as you progress, more and more of them get thrown together in increasingly more challenging waves until you can barely find a safe space on the screen to launch your attacks from. Fortunately there are, as you might expect, plenty of power-ups to grab – although these are skill based: the kind of item yielded depends on the depth at which the item carrier is destroyed. They're also on a timer, so use them while you can. Aaaaaaand… that's about it really. I told you this game is simple. But like I also said before, it's Fun (with a capital F). Fun in that addictive, classic arcade way where you can turn off your brain, dial up your reflexes and get lost in a sea (no pun intended) of bullets and power-ups for as however long as your fingers can stand it. And if it does get too much for you, you can always play co-op with a friend. Graphically, the game is quite a treat. It's a retro-modern, pixel-style take on the old classic side-scrolling shooter, but overlaid are deft touches and details that are only possible for modern era games. That helps elevate Aqua Kitty from being just a knock-off, and gives it an original, distinctive look. The controls feel generally good. It might have been nice to have a little bit of inertia on the ship's movement to give the game a little more feel, but then again, on higher levels when there's little room to maneuver, the twitchily precise controls do work well. 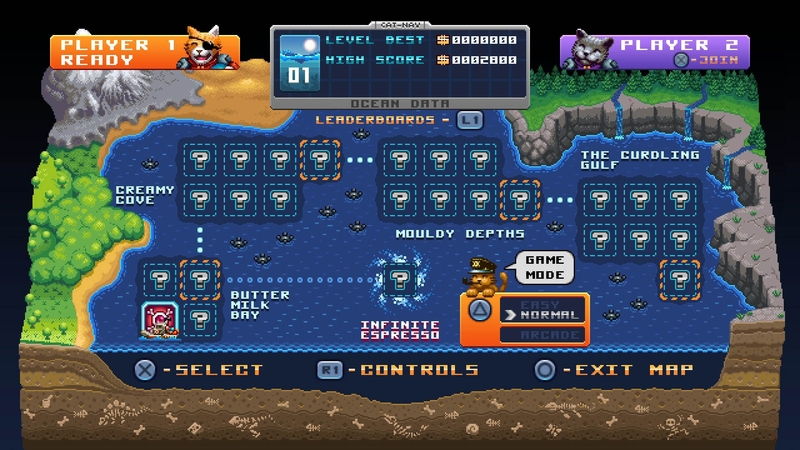 Ultimately, Aqua Kitty DX is a straight-up, unpretentious, lovable game that's both cheap and extremely cheerful. What it sets out to do, it does very well, and to be blunt, if you like the looks of it, you'll probably like the way it plays. It's one for those who grew up on the likes of Gradius, Mr. Heli and Defender, and is excellent for short spurts of intense play. In a way, it's an almost perfect contrast to some of the deeper, more complex lifestyle games most of us have been playing of late. And damn, those kitties are cute. Retro meets modern. Lovely pixel graphics with contemporary effects and overlays. The music and effects sound like they come directly from a Commodore 64's SID chip, circa 1987. Very simple - as is befitting this kind of game. Online leaderboards and a cloud save bring it bang up to date. Aqua Kitty DX has that classic arcade appeal: its simple, timeless gameplay is something you can go back to anytime for a quick blast. 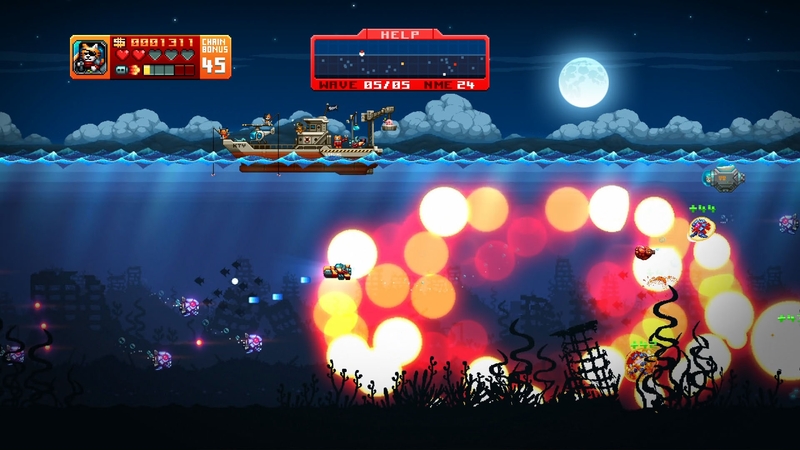 Taking its inspiration from 80's and 90's shooters, Aqua Kitty DX is simple, frenetic and fun. What it sets out to do, it does very well, and the end result is charming, challenging, and purrfectly addictive.